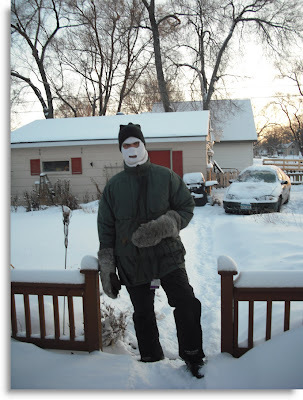 Hey... it was 10 below this morning and I don't like to be cold when I run the snow blower. Sue me. You better be careful...you're gonna end up being mistaken for a robber or something! Seriously, you may be reading about youself in one of those infamous St. Cloud crime logs. You look rather fetching. Sort of Jason meets Sasquach. If you send one bit of that crap my way there's gonna be hell to pay! I feel like I need one of those because it's in the low 60's here! The mask reminds me of the T.V. news story telling us that hand guns are in short supply around the whole country. I hope they are selling for self defense and not future crime. beetle - Just call me Minnesota Mummy Man! sandy - Hey, thanks for the reminder. I should do some more of those crime logs again. kathy - It's a MN grunge thing. It's all the rage here. ed - Hey, I don't like it any more than you do. Trust me, I'm big time over it. gette - I've long run out of patience. Bleh. I am so tired of the cold. That's March in Minnesota though, right? Looks totally reasonable to me! Yikes. And I was complaining about the 65 to 14 in Chicago.... I take it back. I take it allllll back. That's actually a pretty good look for you. I'll think of you while I'm applying a second layer of sunscreen this weekend. bill - Hmmm, I did notice the gas station woman looked a little nervous when I went to get some gas for the snow blower. heather - It's March in Antarctica too. maureen - Ahh... that explains why Canadians are so pasty. michelle - I don't get it. How do we have -17 this morning and you have +16? We're not that far away from each other. whit - Yeah, I can make just about anything work. theresa b - Hey, I can put sunscreen on too. Of course it won't do anything but I can still put it on. So there pffffffttttt! windyridge - Heh... you know what they say about a guy with huge mittens. Your crummy snow is falling here, bleh. So did you go right from snow blowing to your job as an axe murderer? What kills me about clearing the snow is the amount of time and energy that is involved in getting dressed and undressed for the occasion. Each time I do it, I ask myself...how many years til we can retire to one of those communities where OTHER PEOPLE maintain the property. Just don't drive anywhere wearing that mask. You'll find yourself surrounded by a SWAT team. I noticed the lift ticket on your coat, did you go snowboarding again? mom thumb - No, I lost my job as an axe murderer. You know... the economy and all. ann - Yeah, but do you think the SWAT team will help me shovel my driveway? rick - No, I'm too old for that. That was from when I went to the tubing hill with Roseanna in Feb. This picture explains the Coen brothers.